Advocacy: The FHA serves as an advocate on important legislative issues and legal matters related to maintaining the vitality of the community, and protecting the rights of floating home owners. The FHA joined in an amicus brief to the U.S. Supreme Court that resulted in a decision protecting floating home owners from onerous maritime law, negotiated a new Shoreline Master Program that would allow all existing floating homes to remain on the lake even if current moorages are lost and drafted, negotiated and lobbied for state legislation that defines floating homes as a conforming and preferred use, thus protecting owners from unreasonable conditions and mitigation by local governments. The FHA also represented members in the scoping and construction of the Westlake cycle track, successfully raised concerns about the impact of a proposed Habitat Conservation plan on the members of the FHA and was the liaison between floating home owners and the US Army Core of Engineers Provide valuable information during the low lake levels of 2015 which threatened some homeowners. In 2016 when members began receiving notices of violations for home repair, the FHA began productive dialogue with the city regarding this issue. In 2017 the FHA is hoping to reach an agreement with Seattle City Light regarding changes to code which could affect homeowners. FHA E-Alerts and Facebook: News doesn’t happen just twice a year. 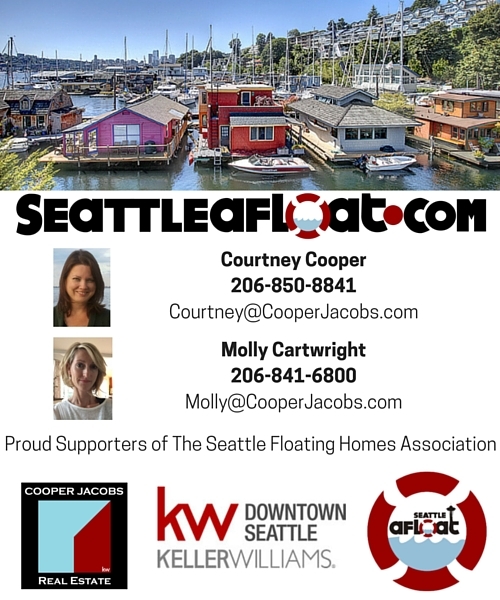 Breaking news, upcoming events, stories and photos related to the floating home community are accessible through email alerts sent to members via your email address. You can also join our private Facebook Group – feel free to post ads, ask questions, share musings, photos etc. FHA Website: The FHA maintains an informative website with links to details about the association history, advocacy, community, environment, safety and security, and news and events. FHA Annual Meeting: Members are encouraged to attend and participate in the annual meeting, which takes place on a weekday evening in the Spring (usually late April). The agenda typically includes a social hour, the latest update on what the board has been doing for you, a legislative update, board member elections, and engaging and relevant guest speakers. FHA connects me to the people & causes closest to me, literally! We are a unique group of people who have a wonderful lifestyle. And, sometimes there are challenges with preserving that lifestyle. FHA serves as an advocate for our collective community when we need to have a collective voice. FHA works with the state legislature to preserve our rights. FHA helps our docks that might be facing the scary proposition of expired leases or owner turnover. FHA keeps me informed of interesting things going on with the wonderful, eclectic people in my watered-down backyard. FHA does the stuff that needs to be done so we can go on living exactly where we want to live. FHA aggregates useful knowledge and resources for floating homeowners whose needs are slightly different to land dwellers.